Borneo!!!! 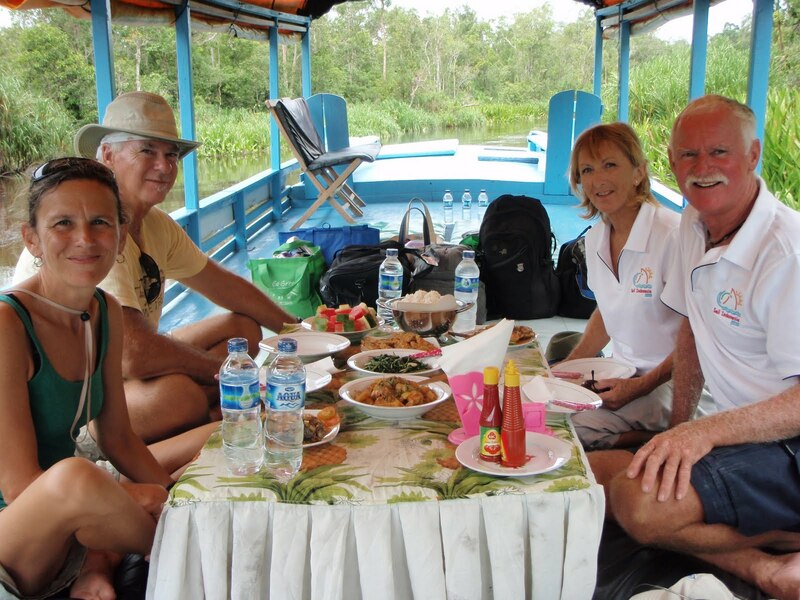 Who would have thought we would motor 60 miles up a big, brown river on the south coast of Borneo to a place where we could observe orangutans in the wild? Tanjung Puting National Park is the site of a reserve established in the 70s by a Leakey protégé. The animals, many of them captives or dislocated by deforestation, flock to feeding stations for handouts of bananas and cassava root. From the huge, intimidating adult males to the tiny babes in arms, they put on quite a show, especially when they crash through the jungle, swinging from tree to tree. Travelling through the dense jungle from the dusty little river port of Kumai was at least half the fun. 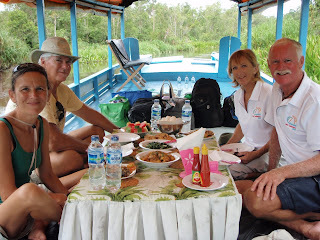 We chose an overnight on an open air houseboat. The crew of four provided three hot Chinese meals a day, nonstop information in English, and reminders about the need for protective gear – mosquito repellent, sunscreen, water, and socks and shoes to ward off the leeches.